Figurative artists Eldzier Cortor, Hughie Lee-Smith and Charles White stayed true to their roots in social realism as their work evolved in the post-war decades. Unlike contemporaries Charles Alston, Norman Lewis and Hale Woodruff, these three resisted the trend towards abstraction, or “going modern” as Woodruff called it. Their shared experiences in the Chicago Renaissance of the early 1940s, the WPA and the rapid growth of urban culture helped shape their artistic identities. 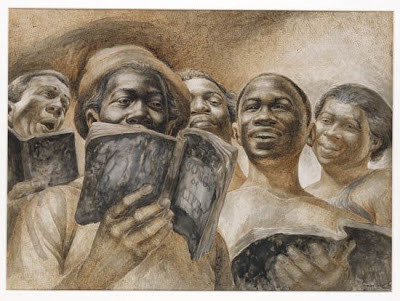 Charles White’s large pen and ink, Songs of Life, 1953-54, demonstrates his tremendous commitment to realism and drawing through the 1950s. Just as White’s career was peaking in New York with exhibitions and museum acquisitions, social realism was falling out of favor artistically and politically. White added a sense of grandeur and dignity to the realism of his large-scale depictions of working men and women, and his work received new critical acclaim. In the following decades, when painting outgrew the easel, Charles White continued to elevate the genre of figure drawing through his own life-sized statements of black dignity. 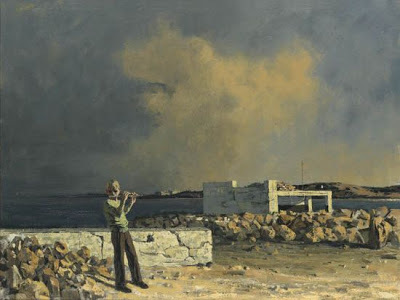 Hughie Lee-Smith also continued to explore his social-realist message in his mid-career painting. Lee-Smith enjoyed critical and commercial success, winning the Emily Lowe Competition in 1957, showing with Petite Gallery and later Janet Nessler Gallery in New York. His earlier paintings of desolate spaces were largely drawn from personal experiences or those shared by other African Americans. Lee-Smith began to flirt with surrealism by adding ominous elements to his settings, and by the end of the decade, darker undertones were added to his palette while his paintings grew in size from masonite to canvas. Moreover, his figures moved into a new dream-like, psychological space that addressed more universal, existential ideas of isolation. In the post-war period, Eldzier Cortor changed the settings of his figures to redefine his type of realism. 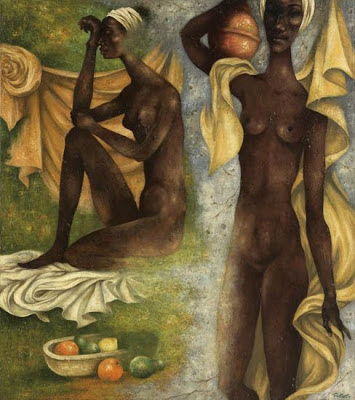 In the 1940s Cortor had already moved his paintings from the working class setting of Chicago to the allegorical or magical realism he found in the South and the Gullah Islands – epitomized by his famous Southern Gate, 1942-4. But in the post-war period, Cortor looked for a more distilled expression, what he called a “timeless” quality. Cortor focused exclusively on the African-American female form; he started a series of prints, drawings and paintings of dancers in the late 1960s, and around 1970, he began another series he called “classical studies” with heads in profile or figures of elegant, elongated and idealized women. All three artists demonstrate consistency in their approach and a trust in the figure as a vehicle of expression, both formally and intellectually. Their unique voices are now regarded as important contributions to 20th Century American Art. Yet these artists don’t fall neatly into the categories of American, modern and contemporary art–a testament to the richness and longevity of their art, and an unwillingness to be defined by convention.